Once again, it’s a double-header episode again this week, as #293 focuses on two great comics creators! First up is Rich Tomasso, THE creator behind Spy Seal, a fanciful yet realistic spy story that follows the adventures of a seal character who becomes a spy! We discuss how he’s bringing this imaginative title to life with Image Comics, who the characters are in this spy franchise, and what we can expect from him in Spy Seal in the future! For more on this graphic novel series and about Rich, go to this website. Then everything concludes with the return of Sam Johnson, who updates us on his Geek-Girl comic, among other things! His Kickstarter for the Geek-Girl collected edition has successfully concludedt! Sam also discusses what’s in the future for this most “human” of super-human comics! For more about Geek-Girl, go to this link! You can follow Sam here to keep up with what he’s creating! It’s a double-header episode again this week, as #269 features my interview with writer Charles Soule and artist Alberto Alburqueque, who are bringing their excellent Oni Press series Letter 44 to a conclusion soon! We go behind the scenes to talk about how this book came to be, how they’ve been bringing individual issues our way, and what we can expect as the comic comes to what I’m sure will be a shocking ending in the next couple of months ahead. For more on this book, go to this link. To follow Charles, go here on Twitter, and to keep up with Alberto, here’s the place to go! Then everything concludes with the return of Sam Johnson, who updates us on his Geek-Girl comic, among other things! The third issue is now available, and we talk about how this is the perfect time to jump on board because Sam’s included a recap for new fans! We also preview the upcoming fourth and concluding issue in this miniseries as well as what the future holds for Sam and this most “human” of super-human comics! For more about Geek-Girl, go to this link! You can follow Sam here to keep up with what he’s creating! 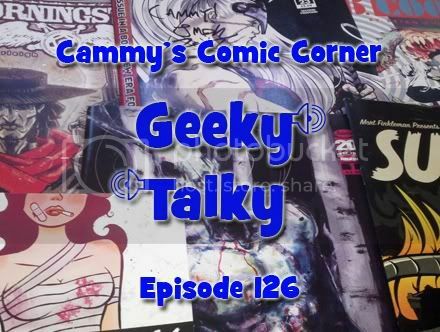 This week in Episode 179, prolific comics creator Sam Johnson returns to the Wayne’s Comics Podcast, talking about when we can expect new issues of Geek-Girl and Cabra Cini, Voodoo Junkie Hitwoman! Then we discuss his book The Almighties and how things are progressing with that title as well! To purchase Sam’s excellent product, go to this link at Actuality Press! Don’t miss them! This week you’ll enjoy the return of Sam Johnson, one of the creators of The Almighties, who talks about their new issue #0, which is now available. He discusses the characters and how this title has moved from parody into its own adventure format, among other things. To get these books, go to this link! He also updates us on his other projects, Geek-Girl and Cabra Cini, Voodoo Junkie Hit Woman, as well! Then I continue my yearly holiday tradition of playing the audio from Twas the Dark Knight Before Christmas, an excellent video you can find here on YouTube. It has a great lesson for this festive season, so don’t miss it! This week, comics creator Sam Johnson is back, talking about special issues of Geek-Girl and Mr. Mash-Up that will be available online very soon! We also discuss Cabra Cini, Voodoo Junkie Hitwoman, and what’s in store for her, then Sam talks about several current Marvel NOW! comics. I’m sure you’ll enjoy listening to our conversation! To find out more about what Sam is working on, go to this link! To order your Geek-Girl comics, go to geekgirlcomics.com! Don’t miss Episode 79 of the Wayne’s Comics podcast! It’s a special Halloween episode of the Wayne’s Comics podcast! This week, comics creator Sam Johnson is back, talking about a special Halloween story with Cabra Cini, Voodoo Junkie Hitwoman, and the return of Geek-Girl, among other projects he’s busy with! We also discuss his continuing ambition to script Marvel’s Deadpool as well as some other comics-related things, so you won’t want to miss it! Then Gianluca Glazer joins me to discuss ‘News & Previews,’ and everything wraps up with my reviews of the latest comics! Don’t miss it! The Wayne’s Comics podcast is now at Comic Booked.Com! Sam Johnson and Mike Gagnon are sharing a parody comic called The Almighties! (I wonder what comics or movie that could be about!) We discuss the characters, the book’s creation, and what projects they have coming you should know about. You can find out more about the comic by going to the book’s website, www.thealmighties.com. Next I give a quick review of the latest books, followed by comics creator David Miller joining me to talk about the latest ‘News & Previews,’ and everything wraps up with my peek into your local comics shop.